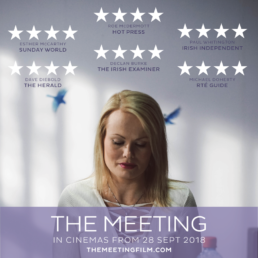 The Meeting is based on a real meeting which took place between Ailbhe Griffith and the man who, nine years earlier, subjected her to a horrific sexual assault and left her seriously injured and fearing for her life. Griffith, in an extraordinary move, has chosen to play herself in this unique drama from one of Ireland’s most provocative filmmakers, Alan Gilsenan. Parzival Productions and Eclipse Pictures approached Bold&Brass last minute to run their social media marketing paid campaign for three weeks. It was quite a challenging project as there was very little content to share (apart from the promo and a few social media cards) and the budget was quite limited for a film. Besides, they didn’t have any social media networks set up, so in the space of three weeks we had to create a follower base on Twitter and Facebook. Furthermore, the sensitive subject matter meant that we had to give much consideration to defining our targeted segments. A challenging but rewarding project at both professional and personal levels.